50,000 Southwest Airlines bonus points offer is back! 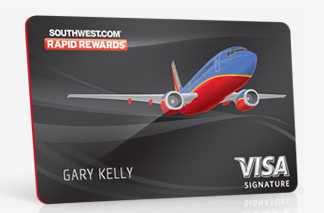 Once again, Chase has been generous enough to bring back the 50,000 bonus points offer on their Southwest Airlines Signature VISA card. The deal is simple, apply and get approved, and spend $2,000 in the first 3 months of card membership, and receive 50,000 Rapid Reward points. That’s enough for 2 round trip tickets on Southwest Airlines. There is an annual fee of $99, but if you fly Southwest, this will be offset by the annual 6000 bonus points you receive for card membership, thus erasing the fee. Remember, your first 2 bags are always FREE on Southwest Airlines. Great for flights to California and the mid-west. No Foreign transactions fees, and access to VISA’s concierge service. Not sure when they will pull this offer, so apply today. Excellent credit needed for this card. Click on the image below for the application page and details from Chase.